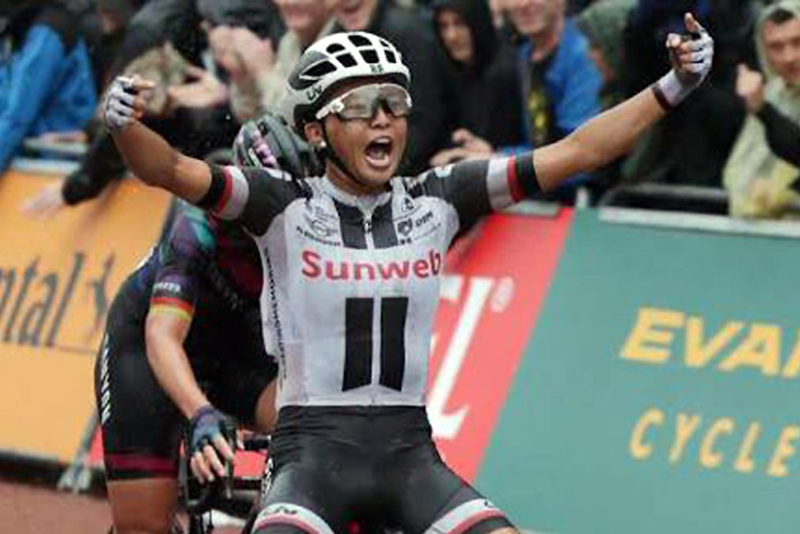 Coryn Rivera is one of the best cyclists today. Being a full-blooded Filipina, she can definitely inspire the next generation of local cyclists.? This was what Allan Tumbaga envisioned for her. ?Allan is the senior VP and chief marketing officer of Pru Life UK, and, upon meeting Coryn by Buckingham Palace right after she won the Prudential Ride London Classique last July, he made it his mission to bring Coryn back to her motherland.? That is what happened during last month’s PruRide PH 2018, as Rivera graced the five-day cycling extravaganza. ?Her presence was the highlight of the event, which brought cyclists from all over the archipelago, and even some foreign competitors.? Coryn has won 71 US national titles, was the first American to win the tough Tour of Flanders, and was part of the 2017 Team Trial World Champions.? PHILIPPINE STAR: Welcome back home. ? Coryn Rivera: Thank you. I don’t even remember much from the last time I was here as a kid. So, to be back as an adult and create my own memories is really special for me. To see my family and figure out who's my aunt and uncle. Last time we were here, my dad brought a bike and there were hardly any cyclists. When I rode in Tagaytay last week, I think I saw 200-300 cyclists on the road and I thought it was incredible.? Are you surprised that people recognize you, stop you for pictures and autographs?? Yeah, it’s really wild. I guess after having such a great year last year racing, I get noticed back home in California and here definitely, so it’s a special thing and I think it’s cool. I want to share what I love the most, which is biking.? You said for the young that want to improve, they need to go to Europe. Why?? Because cycling is a European-based sport and that’s kind of where the history of cycling is and even for me, coming from the US, it’s kind of breaking barriers and rules to go all the way over to Europe to really reach the highest level of the sport. And I think if that’s your goal to reach the highest level, you kind have to sacrifice and break those barriers and do something way out of the ordinary to really reach the top level. So there are some choices and sacrifices you have to make, but if that’s what you want to do, I think that’s the key of getting there.? How did you start in cycling?? I blame my dad. He has always been active. He races motorcycles, downhill mountain bikes, and then, when he got into road bikes, that's when I came into the fold. When I was old enough, he put me on the back of a tandem bike. I did some group rides with his friends and some family. When I was big enough, I rode my own bike and joined a kid’s race that one of his friends dared me to do. And I won that! I got really excited and did it the next year again and won it again! And I looked forward to that race every year. I got a racing license in my junior year and the rest is history! And I continue to progress in cycling.? What's the plan for 2018?? To just continue to build on last year! Last year was a career-defining year for me. I got a lot of world tour wins; I was ranked fourth in the world, so just continue to build on that. You can always do better. You know, learn from the races you won and the mistakes you made. So, just continue to progress and really focusing on the Classiques since they are my kind of races.? Is there more pressure now?? Yeah, the underdog card is gone now, so maybe a little bit. I have to change my mentality of racing. But it’s still the same, you know, last year, when entering a race I was always trying to win. And this year I'll still do the same and do the best that I can with the team. So not a ton is going to change. We’re still focused on winning and doing our very best.? Advice to the young that want to make it big in cycling?? I think you have to work hard, because if you want it hard enough, you really have to put some effort to it. Have fun because if you don’t like what you’re doing, you shouldn't be doing it. Most of all, make the most of every opportunity. An opportunity can be anything from a chance to ride in Europe or the US, or to just overcoming an injury. So it’s important to make the most of everything.? ?